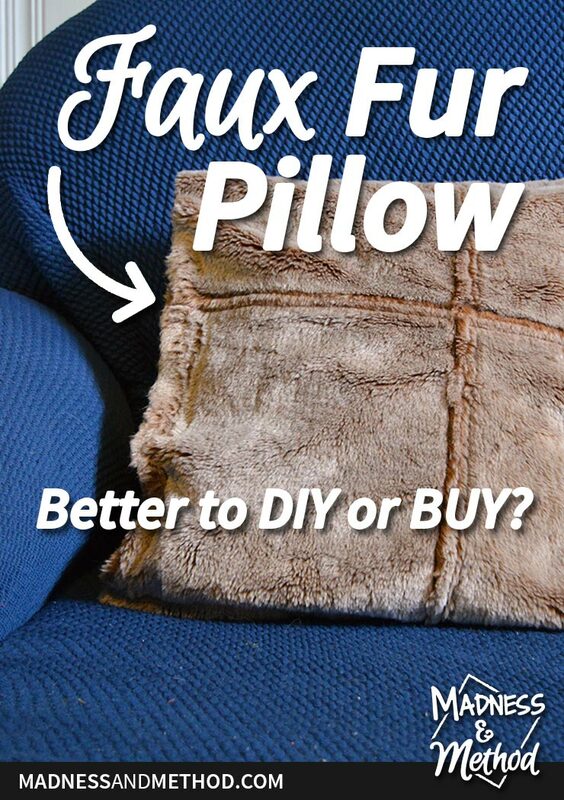 Here’s a DIY to make your own (almost free) faux fur pillows AND I’m sharing a bunch of similar looking faux fur pillows that you can buy for under 50$! 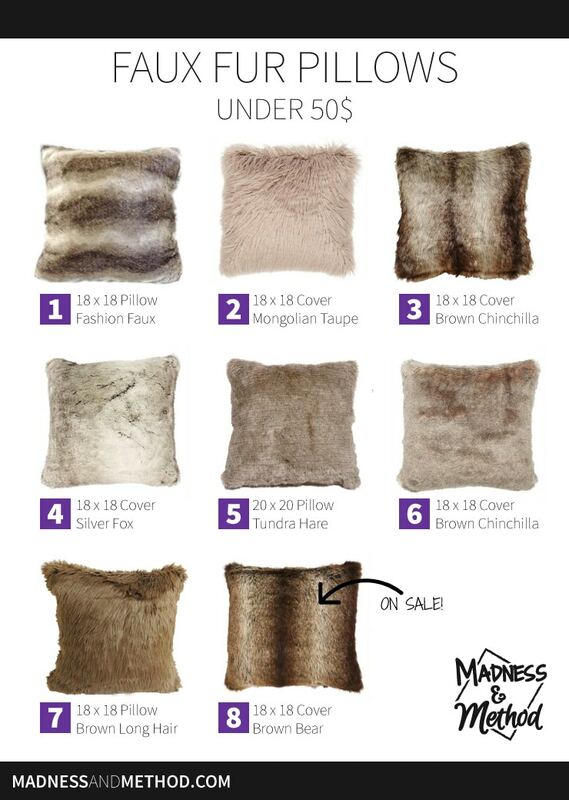 To make some almost free faux fur pillows, I had the genius idea to use an old faux fur coat I had! It didn’t fit me properly, some of the buttons were missing, and some of the fabric was starting to peel off. A while ago I picked up 4 super cheap pillows at Ikea. They don’t have the same ones anymore, but these are pretty similar at 2.99$ each. It was finally time to get to work on my project! I started out by measuring the approximate size of my pillow and cutting out the usable fabric from the coat (ie: not the buttons and sleeves). 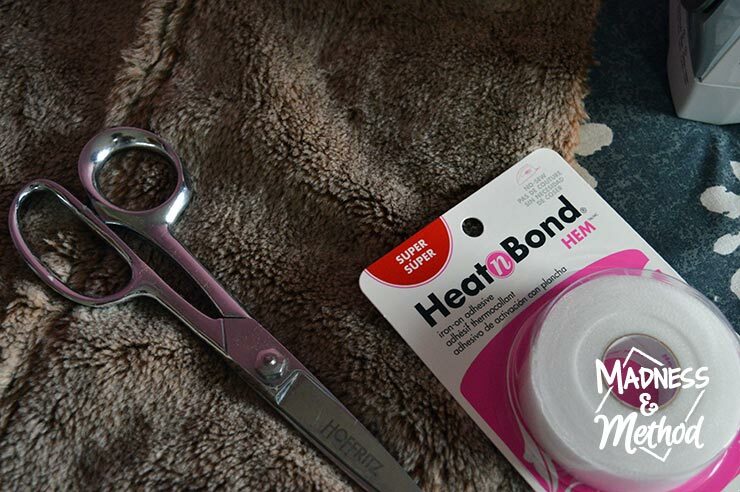 I don’t have a sewing machine, so I decided to pick up some Super Heat N Bond to “sew” my pillow cover together. 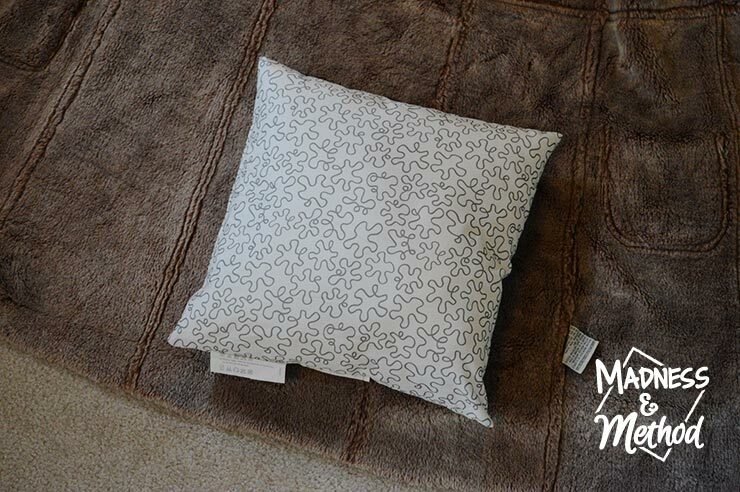 I was barely able to squeeze out two pillow covers; and one of them even has the pocket seams and gaps in the back! 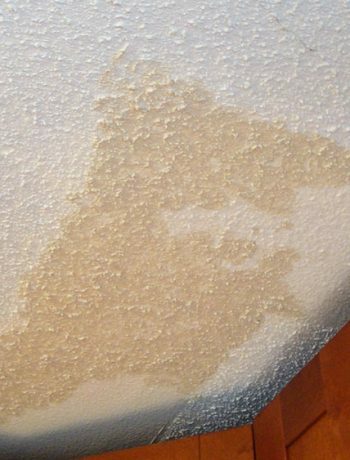 Even so, the colour of the faux fur coat did match my new basement décor perfectly. 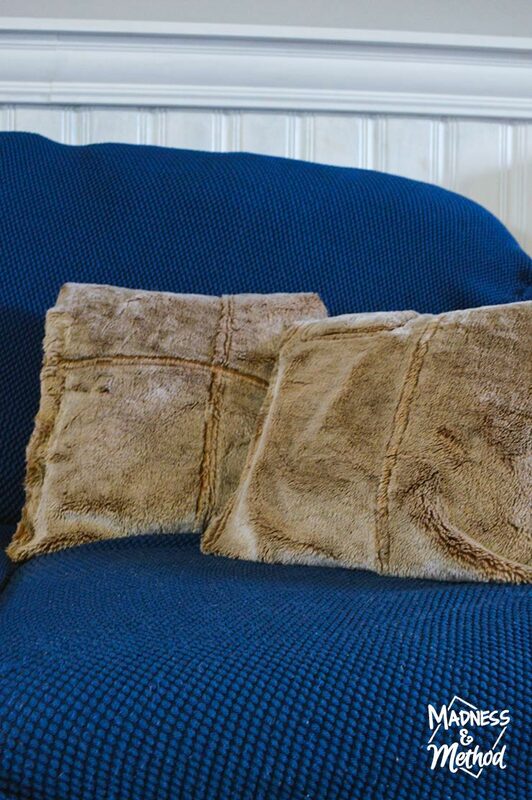 Another downside to not sewing my faux fur pillow covers? There is fuzz everywhere! I had a pretty big mess after cutting the coat, and had I sewed it instead, the seams would be on the inside (so no loose fuzz). 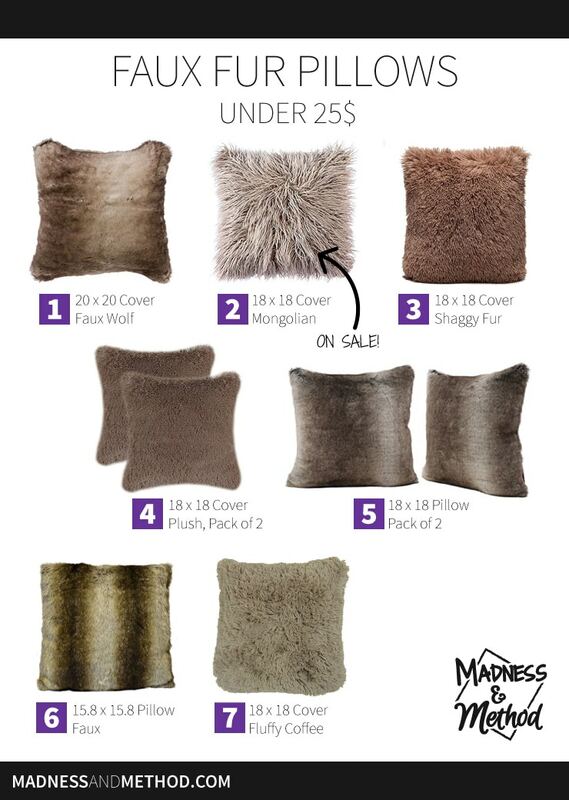 In the end, my faux fur pillows cost less than 4$ each – so a super good deal. However, I’ll be cleaning up fuzz for the rest of my life (until I get them sewed) and technically only one is actually the correct size. 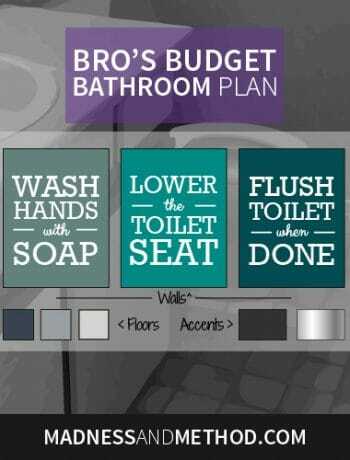 (The other cover is a bit too small). 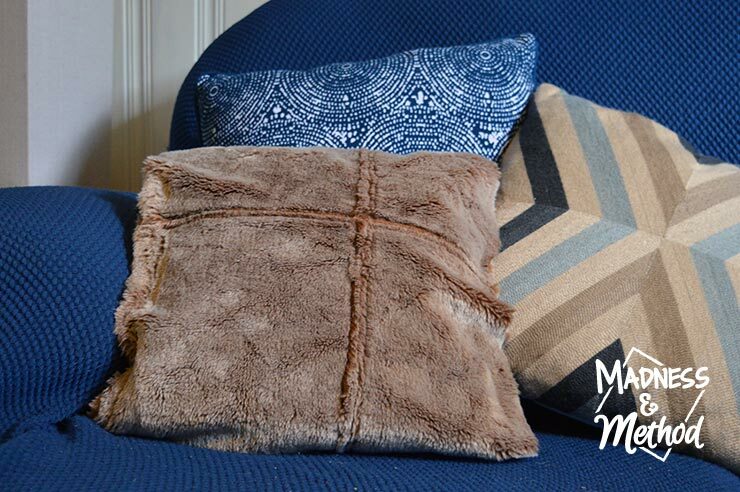 If you were ever wondering if it was better to DIY faux fur pillows or to buy them, then I hope this post help steer you in the right direction. 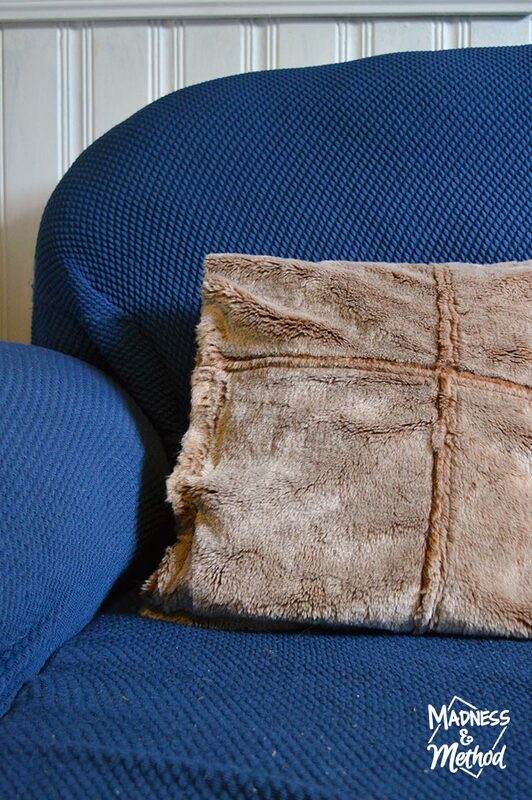 I’m kind of envious of people who can sew, because I feel like your pillows will look so much better than mine, ha! Well, at least I upcycled a coat?